Two thirds of a great cop movie. 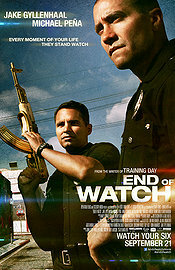 Two great actors with great chemistry (Jake Gyllenhaal, Michael Peña) are living their lives as cops. Just like that, nothing special: car chases, shootings, terrible parents, gangsters… They have chosen a strange life of permanent conflict and often danger, and they know it. Their code of ethics works, when they get into a fistfight with a big-mouthed gangster, the rings come off, and the badge comes off. Then it’s just mano a mano, and the job continues afterwards. We are interested, actually thrilled by following them, because just like them, we are startled by the variety of things life throws at them. Only when things get Hollywood (with a plot against them, with them getting into the centre of attention in a way that makes them so special they are not as interesting anymore), my attention floundered. I wanted to be in a car again with them, listening to their family stories and their philosophies (if that’s what you want to call it) about life, marriage and Mexican girls in the morning. Those dialogues are so well written and performed that they reminded me of what was once called Tarantino-style, but more flowing, less pretentious. In the end, the film seems to understand that it was compromising too much, that it tried too hard to entertain the wrong audience. That wrong audience would long have lost interest when the film gets to its action bits, and the right audience is distracted. The end is comforting again, it brings us back into the car with two guys chatting about, as if this was just another day in a cop’s life.